The other day, a couple of our friends were telling us about how they like to eat healthy and one of their go to dishes was salmon with a vegetable. It made us think and start to feel a little guilty about eating carbs and carbs and carbs all the time. The problem is, carbs are delicious, and so we needed a way to make eating salmon healthy equally delicious. 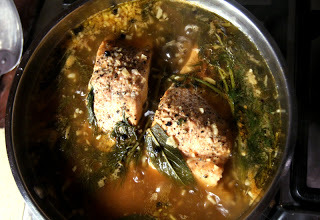 Fortunately, we came across this amazing recipe in the for poached salmon in a dill infused BBQ sauce. 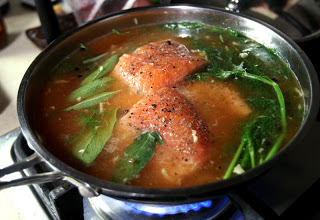 We’d never poached salmon before, but figured that we’d give it a try, and boy are we glad we did. It’s an incredibly simple way to cook the fish, and the sauce is amazing. We served it with a simple side of cucumbers and cherry tomatoes tossed with oil, and taste-buds were extremely happy and didn’t miss spaghetti at all. 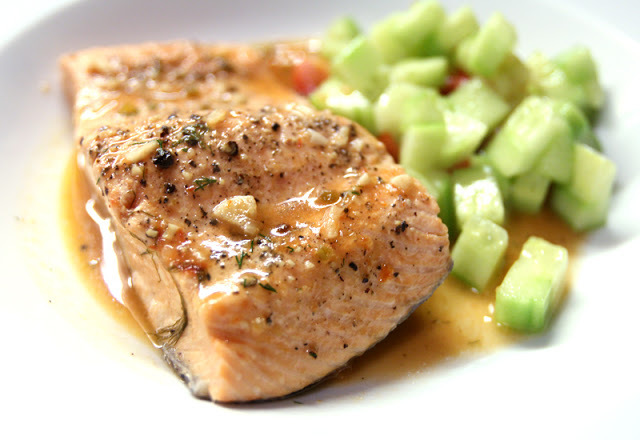 So if you’re looking for a nice simple salmon dinner, look no further than this! Get started by patting your salmon filets with salt and pepper. Then in a skillet that’s big enough to hold them both, melt the better over medium heat. 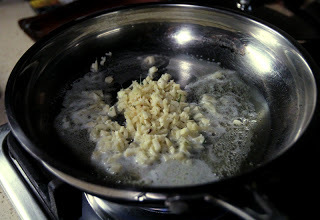 Once the bubbles disappear from the butter, add in the garlic and ginger and cook until fragrant. 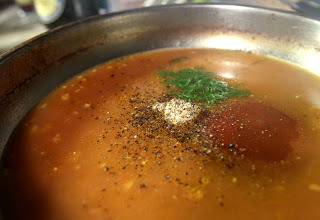 Into that skillet, add in the wine, a half cup of the barbecue sauce, 2 sprigs of the dill, the sage, and the peppercorns. Stir everything together and bring it to a boil. Then put in the salmon filets. If the liquid is too low, add a bit more wine. Return to a boil, and then cover the skillet with the lid slightly ajar, and simmer for about 15 minutes until the salmon is nice and cooked through, it should be slightly flaky and firm throughout. 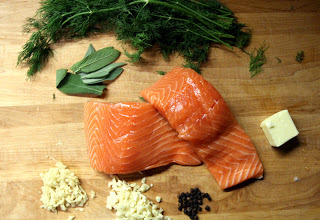 Remove the salmon from the poaching liquid, and use a slotted spoon to remove the dill, sage, and most of the other chunks in there. Chop your remaining dill and when you have about a tablespoon of it, add it to the skillet. Add in the dijon mustard, the rest of the barbecue sauce, and a good grinding of pepper. Then bring it up to a boil and reduce until about half of the liquid is evaporated. 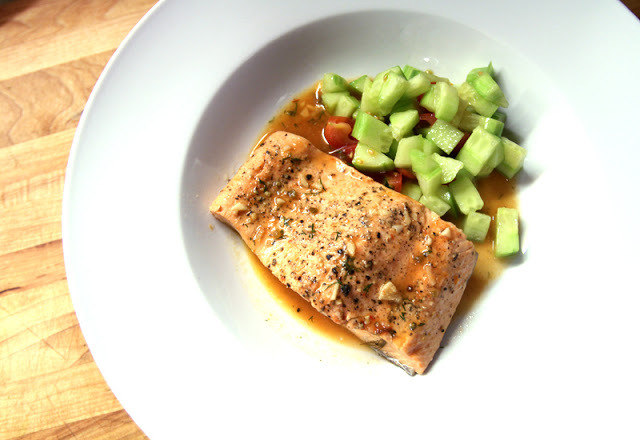 Serve the salmon with your veggie side and spoon the sauce generously over it. Dig in, and be amazed! You’ve never had salmon this good! If you are someone who prefers to order hand stuffed and locally made sausage, then congratulations! You have stumbled across a very unique and delicious meat product that many do not get to enjoy. One of the challenges of purchasing such sausage, or even making your own for that matter, is finding the right spice blend. The following questions are designed to help you narrow down the wide variety of sausage spices in Calgary to find the perfect blend for you. Who Will Be Eating the Sausage? Different people have different things they enjoy when eating sausage. Some prefer their spices to add a nice spicy kick. Some prefer a sweet tang. Others want a musky, smoky flavor when eating sausage. Before you place an order or make your own batch, think about who will be eating the sausage. Consider what their palate tends to desire, and that can help you narrow things down. What Is Your Heat Tolerance? As Marilyn Monroe said in her iconic movie, “Some like it hot!” Others, however do not. Wherever you land on the heat tolerance range is just fine as there will be a sausage spice blend that will perfectly suit your level. 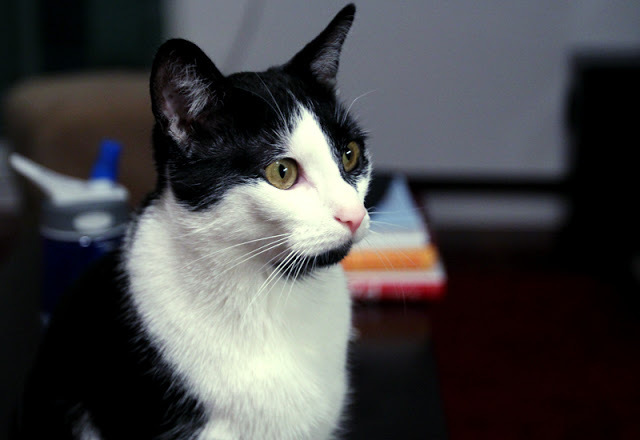 You don’t want to be underwhelmed by the kick of spice, nor do you want to be overwhelmed. Finding the right heat level is an important part of selecting the right spices. Be sure to check all the spice blends you purchase to be sure that none of the ingredients will cause a reaction to these common allergies if they are an issue for you or anyone who will be enjoying your luxury sausage. What Is Your Budget Allotment? Sausage spices in Calgary can be purchased at any budget range. Figure out what you are willing to spend, and go from there. Obviously, the more expensive blends will give you more flavor bang for your buck, but even the less pricey options are incredibly delicious. As you consider these questions, you will be well prepared to find the right sausage spices in Calgary for your sausage making and eating needs. A little bit of forethought will result in the best sausage you have ever tasted, and that is a worthy investment of time.